The goal of the Polytechnic of Međimurje is to be a professionally and scientifically strong European polytechnic and a highly regarded, attractive and professionally managed international scientific community in the fields of tourism, sports, computing and sustainable development. The key areas of Polytechnic`s internationalisation include the internationalisation of education, accreditations, the internationalisation of students and personnel and internationalisation at home. The Polytechnic will select the very best partners from the international science community and fields of practice – companies, professional and vocational HEI`s. Partners, who match up well with our strategic areas of expertise with professional education and science as the cornerstone. Common interests in research result in fruitful partnerships. Accreditations and international rankings play an important role in partnership building. The Polytechnic has actively strived for programme accreditations thus ensuring the functional quality of the programmes. Partnerships are based on reciprocal cooperation and mobility. Our aim is to cooperate on several levels and intensify the cooperation to maximise the mutual benefits. Polytechnic operates within research, teacher/staff mobility, student mobility and in various project applications (Interreg etc.). Austria, Slovenia and Hungary are the key geographical areas for international cooperation regarding European cooperation with strategic goals to spread to Northern America and Israel. The Polytechnic has more than 20 cooperation agreements with various HEI`s. Other important geographical areas are Serbia and Southern Europe. The Erasmus mobility provides a solid basis for all mobility due to long-lasting partnerships, well-balanced exchange with smooth credit transfer with the ECTS system with European partners. For our cooperative work in education, we will create a platform for implementing joint degree programmes together with the best actors, taking into consideration the needs of businesses. Combining these aspects will give rise to a unique structure, especially in the developing markets, in which universities, companies and the experts of the future can create a competitive advantage. Student mobility on first and second cycle is an integral part of Polytechnic degree programmes curriculum. We offer every degree student an opportunity to study abroad during their studies. Exchange of teachers is also encouraged to promote cooperation and credit recognition in the long run. Mobility is encouraged and supported in all levels of staff (professors, researchers, administration, teachers etc.). An example of this is an open annual, or semi-annual call for staff to apply for staff exchange for 5 – 7 days. The mobility at all levels is seen as the key to an intensive cooperation and partnership. Below on the link you can find Polytechnic`s ECHE Charter. In 2016. 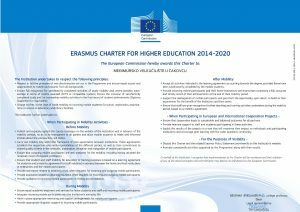 European Commission adapted the Recommendations on the inclusion of higher education students and staff with physical, mental or health related conditions in the Erasmus+ programe. The mentioned recommendations can be found here.